What is procedure drafting, and how can you create successful drafts to ensure your final written policies and procedures are effective? It is useful to think of any writing project as a three step process consisting of Plan-Draft-Revise. What is procedure drafting, and how can you create successful drafts to ensure your final written policies and procedures are effective? First, let’s consider that procedure drafting is somewhat unique from the other two stages, particularly in terms of seeing stages of the writing process as consisting of activities in which writers engage to successfully produce a piece of writing (in our case, writing a procedure). Procedure drafting is, pretty much, a single activity; that of putting words on a page. We can, however, discuss considerations for creating a successful draft. What do we mean by a successful draft? It doesn’t mean that it is perfect and ready for release – it is a “draft. ?” In a successful draft, whether an essay, a report, or a procedure, you have created a coherent piece intended for a user/reader in the proper form. This is different from what is created in the Planning stage such as a process map, outline, or notes and free-writing. The end users will never see those things. They will, however, see the document you begin to create as you start your procedure drafting process. Let’s emphasize, as mentioned above, that it is a “Draft.” You should not be trying to create the perfect written product in the first attempt. The best of writers work with and craft their writing; they never toss words on the page then proclaim “finished.” (That’s what the worst of writers do!) The point is to not become encumbered and inhibited by trying to create a perfect document the first time. Those who came up with the “do it right the first time” slogan never took on serious writing projects. It is important to understand design flow and the difference between iteration and replication. The goal of procedure drafting is to get the writing project off the ground by getting it down coherently in the proper form. Becoming obsessed with perfect grammar, phrasing, and structure with no errors is counterproductive to creating the draft. Plus, it is somewhat freeing to create a draft and call it a draft. The word itself implies that it is not finished – a work in process. Now when reviewers point out errors and make suggestions you do not need to take it personally. They are only helping you work on your draft. This perspective can alleviate some of the fear and dread many of us have when it comes to writing. I noted earlier that procedure drafting is an activity in itself, not a group of activities like other writing stages. One thing that could be listed as a separate drafting activity is document design. (Some might consider it a Planning activity, but since it deals with creating the finished product I feel it is fair to call it a part of procedure drafting). What form should your procedures take? If you are in an organization with established procedures then this should already be resolved. If it is not, this is an issue that needs to be addressed quickly with those responsible for procedures and the document system. Procedures should have a very consistent look and feel throughout the organization, regardless of their purpose or the department or segment in which they are used. Their appearance should be as familiar and as easily recognizable by organizational members as are other well-known documents such as bills of materials, invoices, and product specifications. 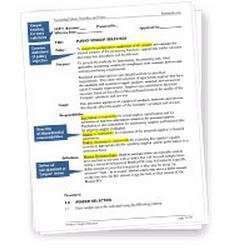 Typical sections in a procedure include Purpose (stating the goal of the procedure), Scope (involved parties and departments), Responsibilities (usually by job title), and Definitions of key terms. After these introductory sections, at Bizmanualz we divide the body of the procedure into Plan-Do-Check-Act sections, reflecting how a continually improving process is structured. (For a positive example of procedure document design, view a Vendor Selection Procedure available on our website.) Your organization, however, should structure its procedures in a way that best meets its needs. Another format consideration is the numbering scheme. Using numbering, as opposed to simple paragraphs, makes the document user friendly since readers can keep track of where they are in the document, and it makes the chronological nature of the process very overt. Writing the Draft also requires thought about the level of detail documented in a procedure. Procedures should document the basic activities needed for the process to transform inputs to outputs, but that doesn’t mean it should reach the level of detail of a specific work instruction. Let’s consider the example of baking a cake as a process. The procedure should identify the required inputs, describe the goals (make a delicious cake) and objectives (baked thoroughly in the center but not overdone in the corners, etc. ), and include some specific requirements (i.e. mixing time, baking temperature, and baking time), best practices (i.e. let the butter soften, use a whip not a fork). Let’s say, however, the baking process includes a complicated oven that is not intuitive to operate. What level of oven operating instructions should be included in the procedure? I would argue little to none. If you were to remove the original oven and replace it with one that was still complex to operate, but had completely different controls, etc.., would that change the procedure? Does having a different piece of equipment that performs the same function really change the process? Typically, no; the process is not different, and the goal of the procedure should be to document a process, not to explain how to operate a piece of equipment. That level of detail should typically be placed in a work instruction or a visual job aide. It is a common error that procedure writers make; trying to incorporate intricate levels of detail about operating equipment, using computer applications, etc., when the procedure should focus on executing the process, including objectives, measurement, review, and improvement, not operating equipment. While there might not be specific activities to discuss in terms of procedure drafting, I hope discussing these issues will help you when you have completed planning activities and you are now ready to sit down and draft the procedure. ISO 9000 Internal Auditor classes are forming now. Call for information on having your own private in-house classes today.